To celebrate my birthday, and yes, this one is a biggie, I am going to host a number of exciting giveaways during March. You only turn 30 once. But before I tell you more about this week’s giveaway (below the recipe for those of you slightly impatient), I must share a recipe for one of the best desserts I have had in a while: Turkish Delight donuts. That’s right!!! Last weekend I had the pleasure of dining at Shane Delia‘s Maha Bar and Grill and frankly, while all of the tasting plates were delicious, I just had to leave room for these light and fluffy rosewater Turkish Delight donuts. I’m not big on desserts but boy, these were amazing. Drizzled with a rosewater honey syrup and sprinkled with pine nuts, they are what food lover’s dreams are made of. And the best part? I got to take the recipe, complete with the essential ingredients, home. They sure know how to keep customers happy long after they’ve left the venue. I know, I was there. I’ve changed the syrup recipe up a little, with no disrespect to Shane, but I felt there would be too much syrup based on the ingredients provided on the packet. The amount I made was just right. One other tip: wear single use latex gloves when forming the donuts by hand, easier to handle and clean up. And if you don’t have a set of scales accurate to 1g, then I suggest trippling the recipe – most dry yeast sachets have about 7g of yeast in them, so just don;t scrape every last bit out and you should get 6g. To make the donut batter: combine warm water, flour, sugar, yeast and salt in a measuring jug. Mix until smooth, then stand in a warm place for about 15 minutes until the dough hs roughly doubled in size. Heat cooking oil to 180C in a small saucepan – about 3cm deep for shallow frying, or double that amount for deep-frying the donuts. The first will be shaped more like patties, the second should be more round. To cook the donuts: take a small handful of batter into your hand (latex gloves help), place a cube of Turkish Delight in the middle and scrape the batter onto your fingertips until it’s almost a ball. Lower your hand over the oil and gently drop the batter ball in. Cook for about 20 seconds on each side, or 30 in total if deep-frying – they should be puffed and golden brown. Remove from oil with a slotted spoon and drain on kitchen towel. To make the rosewater syrup: combine rosewater and vanilla extract in a small saucepan and bring to a boil. Remove from heat, add honey and crushed nuts. Set aside to cool down slightly. 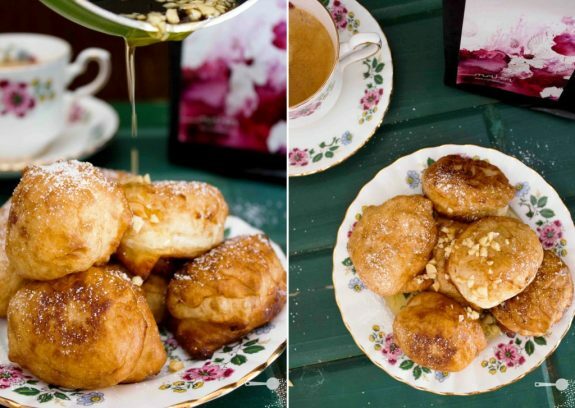 To serve: you can dust the donuts with some icing sugar, and serve with a drizzling of the rosewater syrup. Best served warm. First up is one of my favourite food-related books ever: Flavours of Melbourne (valued at A$69.95) with thanks to Smudge Publishing. It’s a must have for anyone as much in love with the Melbourne food, bar, art and laneway scene as I am, but even those of you new to it will find the photography and narrative inspiring to eat out and hang out more in and around the 3000 postcode. There are recipes too! Sign up to receive email updates from WholesomeCook – you’ll be the first to get new recipes and details of new giveaways. Giveaway open to Australian residents, or those with an Australian postal address only. Entries close midnight Sydney time on Thursday 8 March. Winner will be announced in a post on Friday 9 March and notified by email. If you are an Australian resident who leaves a comment and you are already following me on Twitter or Facebook, you will automatically receive extra entries. That sounds sooo good! I’ve never tried turkish delight, but I’ve always been curious. Oh man, these donughts took AMAZING but I don’t think I have the skills to cook them without buring the house down. AND great looking book…I’m totally 100% in love with Melbourne. One of my favourite cities in the world. Wow what flavours! I am bookmarking this recipe as I have to make it given these have rose water in them. Did I mention how much I love donuts?! I know, right? I made 8 and then went to pick the kids up from school and told them I had eaten 4 already. 4? Well, you know, I had to make sure they tasted right before I told the whole world! YUM! They look amazing, I was wondering if you could use chocolate pieces instead of the turkish delight ? I’m sure you could, they take less than a minute to cook do I can’t see why not! Gorgeous pics and beautiful sounding recipe! Love the look of the book too 🙂 Yum all around! “Liked” on Facebook. Have a wonderful birthday! yum yum yum! the donuts look so amazing. can’t stop at one right? Nope, I had 4 before I was “forced” to leave the other 4 for others’ dessert! What a lovely idea! 🙂 I’ve only made doughnuts a couple of times before, only once since i’ve gone gluten free. I think I could adapt these to make them gluten free though, yum! Gorgeous book AND donuts… Doubly delicious! Happy Birthday, Martyna! The doughnuts sound really incredibly good. I love especially the first photo. Have never ever craved doughnuts as much as i do since seeing these, they look delicious. This is something new! I never had donuts like this, surely that Turkish delight inside would blend well with the pastry. This recipe looks and sounds delightful. Also love the sound of this book, the cover is fantastic! I’d love to win this book! It sounds amazing! I feel so lucky to live in Melbourne, Yum! Happy Birthday to you! Thanks for the great giveaway – I am a Melbourne girl and this book looks devine! Wow the big 30! Happy birthday Martyna!!! Happy Birthday! My jaw dropped when I saw these. Honestly. Turkish delight donuts?! The awesomeness kills me. my salad for lunch is looking so depressing compared to this!! Colours and flavours collide yum-I think I might indulge in a Turkish delight and chili hot chocolate tonight ohhh yum!